The next, and maybe last, Hands Across the Border dance will September 6, 2015 with Steve Desrosiers calling. Hi everybody: Just want you to know that we will be starting off the new dance season with the Hands Across the Border dance on Sunday September 6th, 2015. It will be held at the Haskell Library on Caswell Ave in Derby Line, VT from 2 to 4. I will be calling, and hope to make this a memorable Hands Across the Border dance. For all of you who are interested, George Weller is offering a corn roast at his place on either Saturday or Sunday after the dance. Please contact George at 819-876-2528 (email: gweller@ctq2.org) for more information on the corn roast. Please join me September 6th, as we join hands with all our friends from both sides of the boarder. Let me know if you plan to attend so we can plan accordingly. Your square dancing friend and new caller. 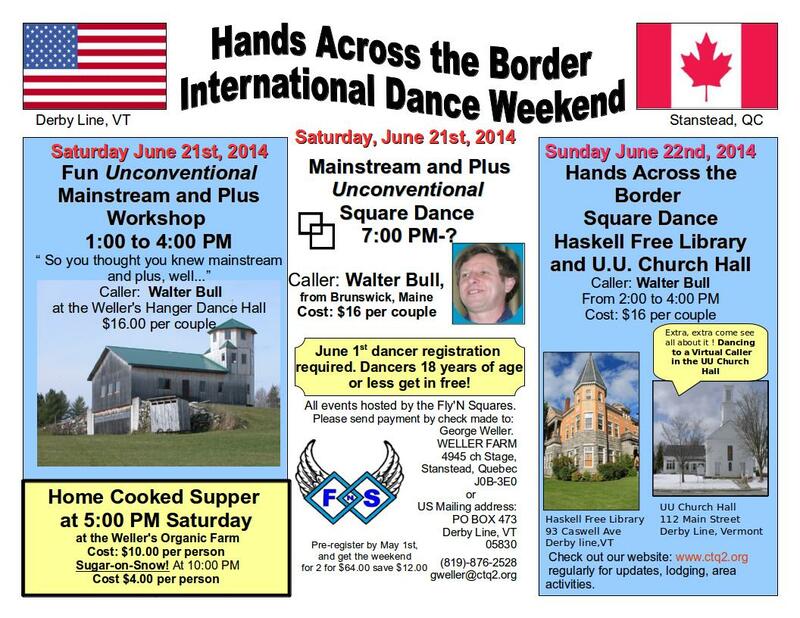 To indicate what it is like, the last Hands Across the Border dance was in 2014 featuring a US caller, Walt Bull from Brunswick, Maine (actually Topsham). He really puts the fun in square dancing. If you haven’t danced to Walt yet, you have missed a lot of fun, so here is your opportunity! It is not Father’s Day weekend, but we strongly encourage Fathers and families, so kids 18 and younger get in to dance free. We usually alternate biannually between Canadian and US callers. If you would like to call, please let Fly’N Squares know. You will not need a passport or work permit as you will call from your country’s side of the border line in the library reading room where the border line is painted on the floor. Below is the flyer for the dance in 2014 Click on them for a printable version. You can register on line right now by following this link. Below the flyers is a partial list of things you can do in this area, and also things you can do right here on our large farm. U pick fresh apples, pears, and many garden vegetables. Check out our Golden Retriever puppies for sale. Self contained camping, walking on trails, checking out ponds, explore woods and wildlife (like dear, fox, coyotes, mink, very large turtles, and at rare times over the years there have been bear-moose-cougar-wildcat all seen by me), vistas, airplanes, the off grid solar and wind installation we designed and installed, the sawmill facility we built. You can also just relax and enjoy the quiet of being in the country. If you are coming from the US side, you will need a passport or enhanced drivers license to come through Customs to activities at Weller Farm in Stanstead. There is no identification required to dance at the Haskell Library as it is a special international location that was built on purpose straddling the border. 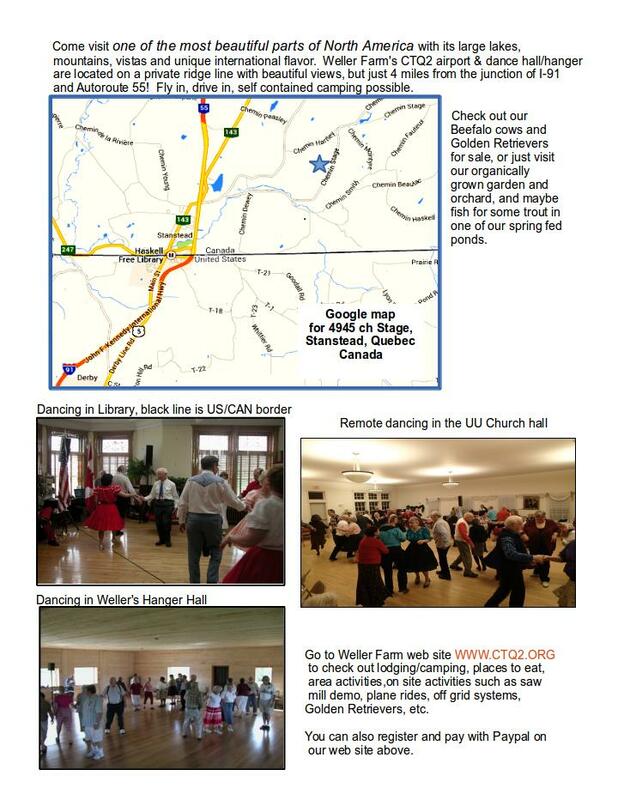 To dance at the overflow UU Church hall and are coming from Canada, you need to enter the US with some ID. You can then park near the church which is almost next to the US Customs on Main Street Derby Line, VT.